Studio 6 in Plano is a recently renovated hotel that specializes in providing all of our customers with comfortable rooms that are perfect for longer stays. We designed our rooms with full kitchenettes, extra comfortable furniture, and all of the modern conveniences you could hope for. If you are staying with your family, we have suites available that will make the trip more comfortable and fun for everyone. Book a room with us today and see the difference between staying at Studio 6 and anywhere else. When you stay with us, it is as close to being in your own home as possible. Enjoy free Wi-Fi, free local calls, on-site coin-op laundry, a business center, a fitness center, and clean, comfortable rooms. Best of all, kids always stay free and we welcome pets! Studio 6 in Plano is conveniently located close to many restaurants, local universities, a world-renowned medical center, and many great outdoor locations where you can experience Texas in all of its glory. We are located within minutes of Dallas, so if you want to stay in a comfortable, affordable hotel, Studio 6 is a wonderful choice. Contact us today as our rooms fill up fast. We can’t wait to offer you a better stay at a better price. While many hotels in East Plano would like to say that they have the largest, most comfortable rooms, the most convenient location, and the best amenities, only Studio 6 can claim that distinction. Come stay with us. Each of our newly redesigned and redecorated rooms features cozy styling, a full kitchenette, and furniture so nice, you’ll want to take it with you. We have multi-room suites available, which are perfect for families and long stays, and pets are always welcome at Studio 6. Our hotel is close to a number of great restaurants, the historic downtown, and several great colleges and universities. Downtown Dallas is only a half-hour drive away. 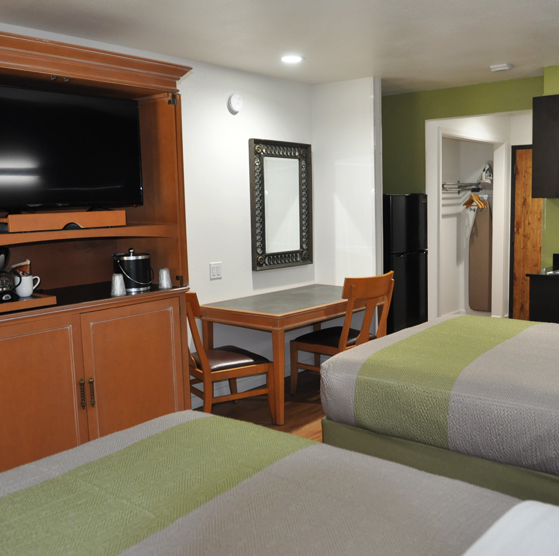 At East Plano’s Studio 6 extended stay hotel, you always get more in your room and less on your bill.